We acknowledge that God has assigned to parents the responsibility and privilege of raising their children in the nurture and discipline of the Lord. The primary purpose of the children’s ministries at First Presbyterian Church is to strengthen and assist parents in the Christian nurture of their children. Secondly, children’s ministry provides an opportunity for all church members to use their spiritual gifts in serving our covenant children and their parents for the common good. Thirdly, we seek to evangelize unchurched and unconverted children. We believe that strong, healthy families make a strong, healthy church. 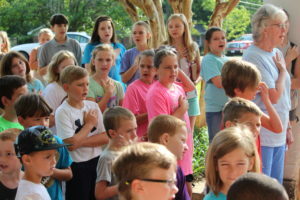 Kids’ Challenge and children’s choir on Wednesday nights at 6 p.m.
Sunday School each week at 9 a.m.
Children’s Catechism during Evening Worship led by Mrs. Lois Hayes.